PILOT PENINSULA is the popular local name given to Crawford Peninsula. 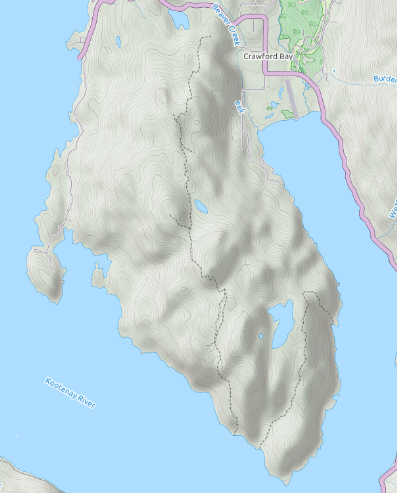 The true Pilot Peninsula is the smaller one where the lighthouse is located. These trails are mostly on Crown (public) land, with some designated woodlots. Please use caution on Forestry roads. If you find a trail not described here, it is headed towards private property. Please stay on the trails listed and respect landowners. Drive south on Pilot Bay road. Watch for the trail sign at 3.3km. If you continue along the road, you will soon find the Lighthouse Trail (#9) at 4.3 km, an easy .5 km hike up to a climbable, historic lighthouse with wonderful lake views. 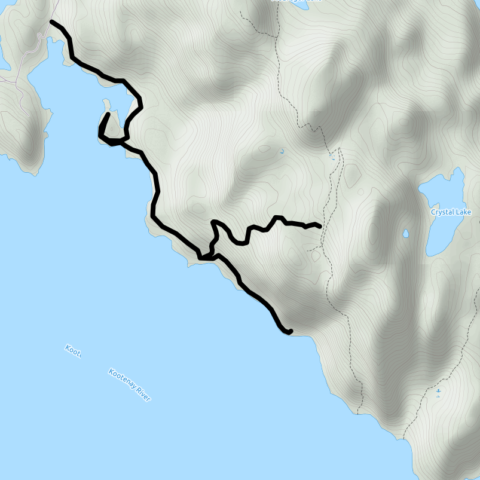 Backtracking to Sawmill Bay Trail (#10), there is parking at the trailhead. Follow the lake shore 1.5 km to Sawmill Bay. Turn right at the next intersection to the park campground, or continue another 1.5 km along the Lakeside Trail (#6) to Boomer’s Landing. After this point the trail becomes more challenging with steep sections and drop-offs. Drive up Peter’s Road from Hwy 3A. At 0.8 km, a signpost marks the Woodlot Trail (#1). After 2 km the trail meets the William Frazer Trail (#2), originally made by Jack Houghton around 1898, when he was the postmaster in Crawford Bay and packed the mail in from the Pilot Bay townsite. A left turn at this point brings you on to the Height of Land Trail (#3) which leads to the Trail Hub (#4) at 6.5 km. There is a stretch where the trail follows up a road bed, with an intersecting road crossing it. Just head uphill; where the road turns and levels out the trail is marked with a post. After a gradual uphill walk through the forest, you will come to a lovely viewpoint before descending to the Trail Hub. 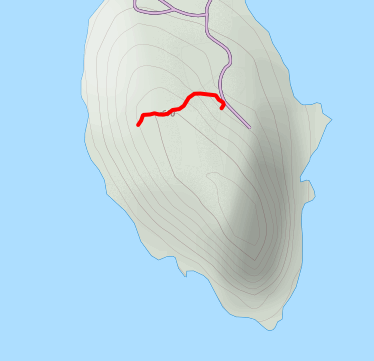 (#4) 3.5 km along the Pilot Bay Forestry Road, with a high clearance vehicle. A 4WD vehicle may be required in wet conditions. Enjoy a 30 minute hike up to the Height of Land viewpoint and return. The Boomer’s Landing Trail (#5) leads through old growth forest to a SW viewpoint, then down to the Lakeside Trail and a beautiful pebble beach. Be aware that the return trip will be a stiff uphill hike! East from the Hub about 400 metres you will find the East Side Trail (#7). After descending through forest you will cross Crystal Road, picking up the trail again a few metres to the north. The trail later connects with a logging road for .6 km; watch for signposts. Try a circle route along the East Side and connecting with Upper Levels (#8) enjoying several view points, marshes, and terrain changes, then back up the Boomer’s Landing Trail. Or, head down to the Lake Side trail and emerge eventually on the Pilot Bay road, if you have had the foresight to leave a vehicle there.